Research shows children as young as 6 months old are able to categorize people by race. By 4 and 5 years old, children start to discriminate against peers. 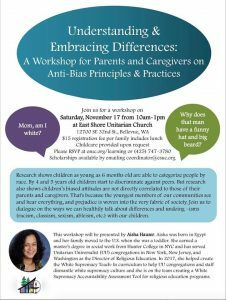 But research also shows children’s biased attitudes are not directly correlated to those of their parents and caregivers. That’s because the youngest members of our communities see and hear everything, and prejudice is woven into the very fabric of society. Join us to dialogue on the ways we can healthily talk about difference and undoing-isms (racism, classism, sexism, etc.) with our children. All are welcome. Register today. $15 registration includes lunch (vegan and meat options available). Childcare provided upon request at time of registration. 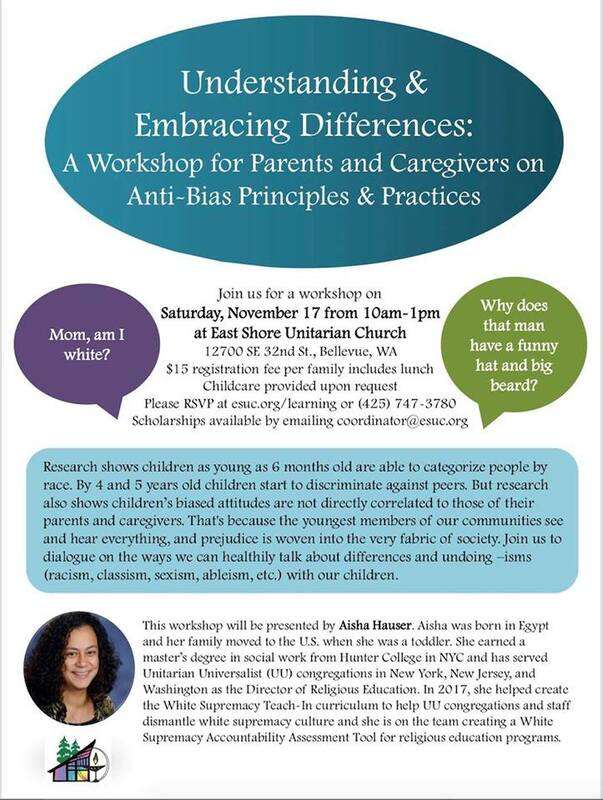 Aisha Hauser, East Shore’s Director of Lifelong Learning, and educator for racial and multicultural justice, will be leading the workshop.